Adidas Solar Boost are neutral cushioned running shoes. 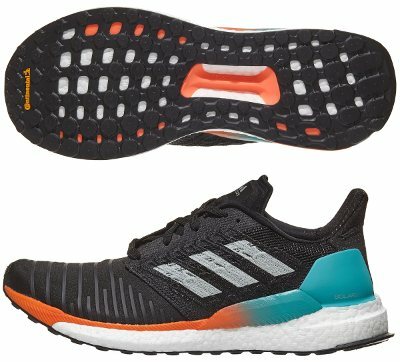 Trendy Adidas Solar Boost is leading new premium Boost™ running shoes from german brand which aims to consolidate under new Solar naming good old Supernova lineup: Solar Glide will replace Supernova Glide 9 and Solar Glide ST will succeed Supernova ST leaving successful (and expensive) Ultra Boost (and Ultra Boost ST at their own. Theorical predecessor would be the iconic Energy Boost 4 but current Solar Boost goes beyond typical annual update and this need to be reflected also in commercial name. Upper is splitted into two zones where more elastic and breathable mesh with crossed reinforcements for improved flexibility rules the forefoot while more dense fabric which also includes recycled plastic ("Tailored Fibre Placement") is available in the rest wrapping the midfoot for secure fit without bulky plastic structure from older editions. Rear area keeps solution premiered in popular Ultra Boost with FitCounter™ for increased stability around the heel and larger collar pad ("S-Curve") to provide better protection in Achilles area. Is not surprising the huge amount of Boost™ foam in Solar Boost's midsole but the interesting innovation is the combination of lateral reinforcements ("Solar Propulsion Rails") with Torsion® system to enhance stability. Outsole configuration changes lug pattern in rearfoot a bit but keeps highly appreciated StretchWeb™ concept available at multiple Adidas running shoes like Adizero Boston 6 featuring great grip thanks to fantastic rubber made in partnership with tyre manufacturer Continental®.